"This vacation will stand on its own!" exclaims Rusty Griswold, now played by Ed Helms. It's the 6th feature length film in a series that started with National Lampoon's Vacation in 1983. Rusty was just a boy in the original series of films, and he's now grown up with a family of his own. When he realizes his wife and two sons are bored with their annual summer trip to Cheboygan, MI, Rusty decides to take them on a surprise road trip to Wally World. This trip mirrors the one Rusty took with his parents and sister took in the original. With this film, Rusty is remaking his childhood family vacation, just as Warner Bros. is remaking National Lampoon's Vacation. Other than a few nods to the audience, however, this new film is mostly a straight forward affair. The family drives from Chicago to Wally World in California. Hi-jinks ensure. As Rusty and his family make their way across the United States, they swim sewage ditch, run from an trucker and white water raft down the Grand Canyon with a suicidal guide. A stop at a sorority gets a few laughs, but seems completely out of place. Some of their misadventures generate more laughs than the others. If some of this description sounds familiar, this movie has literally been made before. It's funny, but not ground breaking comedy. While Vacation still values family, it isn't quite as poignant as it might have been either. When the family bands together in the final act, it isn't the triumph it should be. There are dozens of roads that the film might have built upon, not the least of which is the passing of generations. There are very few films that revisit a character, or family, 30 years after their debut. It's a shame that the filmmakers didn't exploit this pathos for both drama and comedy. Rusty's wife Deb is played by Christina Applegate, and his sons by Steele Stebbins and Skyler Gisondo. The family makes an obligatory stop at the grandparents house. Clark and Ellen Griswold are still played by the stars of the original films, Chevy Chase and Beverly D'Angelo. The energy Chevy Chase brings into his 5 minutes demonstrates how Ed Helms doesn't quite tie the entire affair together. Applegate, however, is perfectly cast. More comedy filmmakers need to hire her. 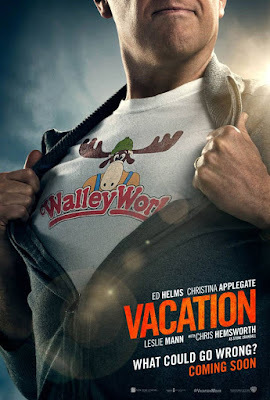 Vacation is a passable comedy, and it's nice to see a goofy comedy aim to do nothing more than amuse the audience. This Vacation, though, isn't going to make the scrapbook's front page.